The Shinkansen is Japanese super express and it's the most popular to travel around Japan except the cars. The fare is bit expensive, but there are bellow merits. 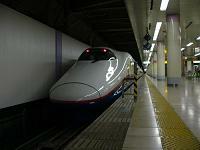 Shinkansen would arrive to the stations at the fixed time. Shinkansen is so fast comparing to other transportations. We don't feel tired comparing to other transportations. Shinkansen arrive at some major stations, it's so convenient. The Shinkansen is so convenient, but actually expensive. So if you want to save your money, I think you would choose the long-distance bus described next.